Primary gastric chorioadenocarcinoma (PGC) is a rare and rapidly invasive tumor. Choriocarcinoma is usually known to be of endometrial origin and gestational; however, it has been reported in other extragenital organs, such as the gall bladder, prostate, lung, liver, and the gastrointestinal tract. Human chorionic gonadotropin related neoplasms of the stomach are seldom discussed in the literature. We report a case of PGC in a 56-year-old man treated with a standard non-gestational choriocarcinoma chemotherapy regimen, EMA/CO (etoposide, methotrexate, actinomycin D, cyclophosphamide, vincristine), with a complete response and good tolerability. Figure 1: Computed tomography scan cross-section of the abdomen showing gastric wall thickening and a large exophytic lesion. Choriocarcinoma is a rapidly growing, highly invasive and widely metastasizing human chorionic gonadotropin (hCG)-producing epithelial tumor with differentiation towards a villous trophoblast phenotype.1 It arises mainly from trophoblastic germ cells and is usually of endometrial origin but may be extragonadal.2 The pure type of choriocarcinoma is uncommon. Mixed types that consist of choriocarcinoma and adenocarcinoma are more frequent. Gastric cancer is a major contributor to the global burden of cancer morbidity and mortality.3 Primary gastric chorioadenocarcinoma (PGC) constitutes less than 1% of all gastric cancers4 and serum beta-hCG serves postoperatively as a serum marker of tumor recurrence. Approximately 30% of patients already have metastatic disease at diagnosis.5 Due to the coexistence of adenocarcinoma and choriocarcinoma, PGC is often misdiagnosed as an adenocarcinoma.6 The presenting signs and symptoms of upper gastrointestinal hemorrhage (melena and weight loss) are similar to typical gastric adenocarcinoma. We treated a patient with PGC with a non-gestational choriocarcinoma chemotherapy regimen, which gave a complete serological response after four cycles. Figure 2: Computed tomography scan of the coronal section of the abdomen showing gastric wall thickening and a large exophytic lesion. Figure 3: Hematoxylin and eosin stain showing adenocarcinoma infiltrates in the gastric wall. Magnification = 5 ×. 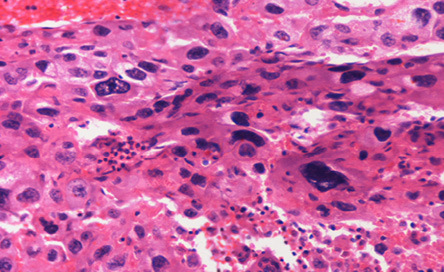 Figure 4: Hematoxylin and eosin stain showing malignant giant cells resemble trophoblastic cells. Magnification = 20 ×. A 56-year-old man with no relevant medical or surgical history presented with epigastric pain, persistent indigestion, tarry stool, and weight loss. An oesophago-gastro-duodenoscopy (OGD) was performed and showed two large ulcerated gastric mass lesions; one along the lesser curvature and one in the distal stomach with spontaneous oozing of blood. Multiple biopsies were taken. A subsequent computed tomography (CT) scan showed gastric wall thickening within the lesser curvature; a large exophytic mass and multiple coeliac and gastrohepatic ligament lymph nodes enlargement [Figure 1 and 2]. Serum tumor markers tests were obtained; his carcinoembryonic antigen (CEA) level was 35.5 ng/ml and alpha-fetoprotein (AFP) was 50.26 mU/mL. The patient underwent a staging laparoscopy followed by an open total gastrectomy. Histological evaluation of the gastrectomy specimen demonstrated an ulcerated and invasive neoplasm composed of cells arranged in sheets and nests. The tumor showed areas of conventional adenocarcinoma [Figure 3] with focal areas of cytotrophoblastic and syncytiotrophoblastic differentiation, consistent with a gastric choriocarcinoma [Figure 4]. Vascular and perineural invasion were present and out of the 57 lymph nodes examined, 23 showed metastasis from the tumor, which had a similar histopathologic appearance. 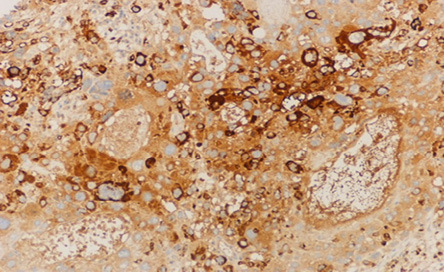 Positive cytokeratin staining was seen in the entire tumor. The neoplastic cells were positive for pan-cytokeratin (CK) and CK7 and showed focally immunoreactivity for beta-hCG [Figure 5] and human epidermal growth factor receptor 2 (Her-2) [Figure 6]. The cells were negative for CD20, human melanoma black (HMB)-45, hepatocyte paraffin 1 (Hep Par1) and AFP. Based on the above features, a diagnosis of a choriocarcinoma-like variant of gastric adenocarcinoma was made. 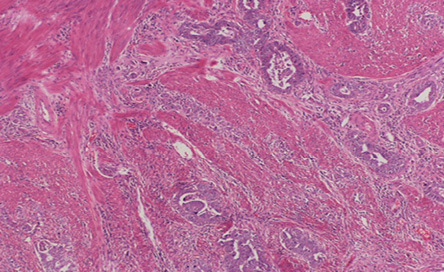 Figure 5: The microscopic appearance of adenocarcinoma of the stomach showing positive immunohistochemical staining for human chorionic growth hormone. Magnification = 10 ×. 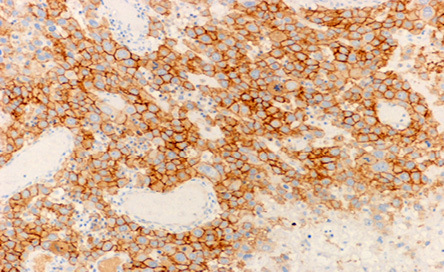 Figure 6: The microscopic appearance of positive HER-2 immunohistochemical staining of the infiltrating cells. Magnification = 10 ×. The patient had an unremarkable postoperative course. Serial serum beta-hCG levels after surgery showed a significant decline to 7 mU/mL 26 days later. Then the patient was treated with a standard non-gestational choriocarcinoma chemotherapy regimen, in the form of four cycles of EMA/CO (etoposide, methotrexate, actinomycin D, cyclophosphamide, vincristine). A CT scan after the treatment did not show any evidence of recurrent tumor. Serum beta-hCG levels dropped to 1 mU/mL after chemotherapy and remained normal 12 months later. PGC was first described by Davidsohn in 1905 and, to date, more than 140 cases have been reported in the international medical literature.7 Several studies revealed that the pathogenesis of PGC can be explained by the dedifferentiation of malignant adenocarcinoma tissue to the level of the embryonal ectoderm, retaining the ability to form trophoblasts.8 This is known as the dedifferentiation theory,9 and was proposed by Pick in 1926 and now it is widely accepted.10 Nevertheless, pathogenesis is still a subject of controversy. PGC has a poor prognosis, high mortality, and a short survival rate unlike primary gastric adenocarcinoma, which has an overall five-year survival rate of 50% for those patients who present earlier with the resectable disease.13 The effective standard treatment regimen for PGC has not been yet established and is still controversial given limited data from the available literature. PGC is an exceedingly rare and interesting neoplasm that is commonly misdiagnosed as adenocarcinoma. Making the correct diagnosis demands a high index of suspicion coupled with the appropriate utilization of beta-hCG immunostains. The response of this case to the standard non-gestational choriocarcinoma chemotherapy regimen (EMA/CO) may help to add another piece to the jigsaw puzzle of the optimal treatment, but more studies and larger clinical trials are needed to define the appropriate and standard treatment. 1. Seckl MJ, Sebire NJ, Fisher RA, Golfier F, Massuger L, Sessa C; ESMO Guidelines Working Group. Gestational trophoblastic disease: ESMO Clinical Practice Guidelines for diagnosis, treatment and follow-up. Ann Oncol 2013 Oct;24(Suppl 6):vi39-vi50. 2. 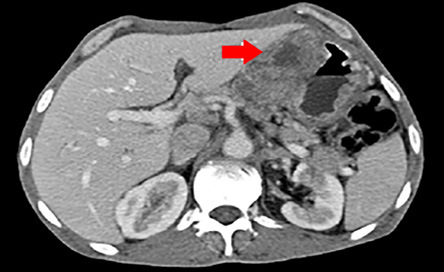 Noguchi T, Takeno S, Sato T, Takahashi Y, Uchida Y, Yokoyama S. A patient with primary gastric choriocarcinoma who received a correct preoperative diagnosis and achieved prolonged survival. Gastric Cancer 2002;5(2):112-117. 3. Al-Mahrouqi H, Parkin L, Sharples K. Incidence of stomach cancer in oman and the other gulf cooperation council countries. Oman Med J 2011 Jul;26(4):258-262. 4. Kobayashi A, Hasebe T, Endo Y, Sasaki S, Konishi M, Sugito M, et al. Primary gastric choriocarcinoma: two case reports and a pooled analysis of 53 cases. Gastric Cancer 2005;8(3):178-185. 5. Sierra-Bergua B, Sánchez-Marteles M, Cabrerizo-García JL, Sanjoaquin-Conde I. Choriocarcinoma with pulmonary and cerebral metastases. Singapore Med J 2008 Oct;49(10):e286-e288. 6. Krulewski T, Cohen LB. Choriocarcinoma of the stomach: pathogenesis and clinical characteristics. Am J Gastroenterol 1988 Oct;83(10):1172-1175. 7. Hartz PH, Ramirez CA. Coexistence of carcinoma and chorioepithelioma in the stomach of a young man. Cancer 1953 Mar;6(2):319-326. 8. Anjaneyulu, Rao SC, Rao RV. Primary choriocarcinoma of stomach. Indian J Pathol Microbiol 2000 Oct;43(4):471-474. 9. Khuu HM, Crisco CP, Kilgore L, Rodgers WH, Conner MG. Carcinosarcoma of the uterus associated with a nongestational choriocarcinoma. South Med J 2000 Feb;93(2):226-228. 10. Pick L. Uber die chorioepthelahnlich metastasierende from des magencarcinomas. Klin Wochenschr 1926;5:1728. 11. 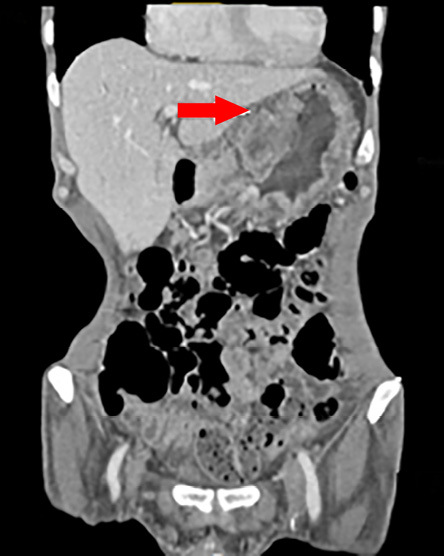 Noguchi T, Takeno S, Sato T, Takahashi Y, Uchida Y, Yokoyama S. A patient with primary gastric choriocarcinoma who received a correct preoperative diagnosis and achieved prolonged survival. Gastric Cancer 2002;5(2):112-117. 12. Jindrak K, Bochetto JF, Alpert LI. Primary gastric choriocarcinoma: case report with review of world literature. Hum Pathol 1976 Sep;7(5):595-604. 13. Al-Amri AM. Long-Term Survival of Gastric Adenocarcinoma without Therapy: Case Report. Oman Med J 2010 Oct;25(4):303-305.